The second cookies I picked up at Hong Kong Supermarket was the Royal Dansk Danish Butter Cookies. 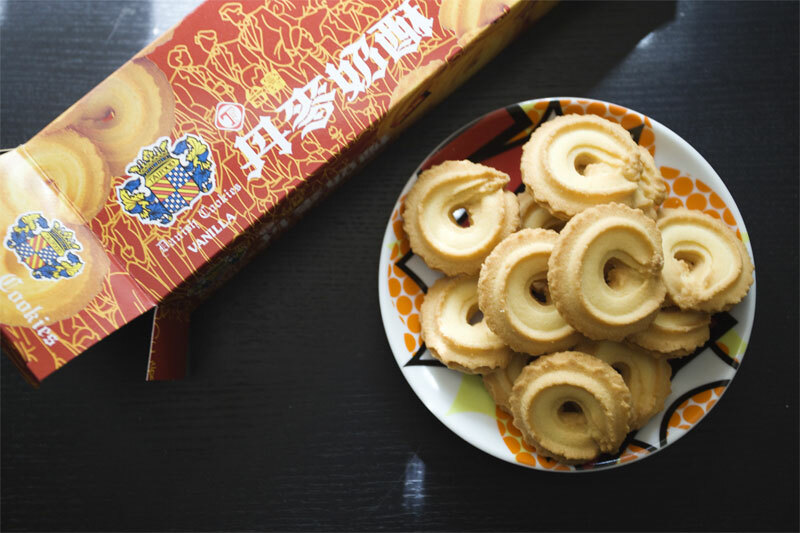 I’m sure everyone is familiar with these cookies and especially the blue tin can that holds these cookies. I don’t know why but I seem to remember seeing the blue tin all the time at home when I was young. No matter what we would always have these cookies around. When it came to eating these cookies, I was very choosy. If you’re familiar with these cookies you would know that they come in different shapes and some with sugar on top. Well for whatever reason I only ate one shape and thats the shape you see in the photo. They were all butter cookies but I only ate that one. I’m weird. Then you should know how excited I was when I see these individual boxes! I ate a couple of these cookies when I got home and was a bit disappointed. They tasted very artificial and I’m not sure if thats because these aren’t from Denmark but from Taiwan?